I stooped over from the waist to get my ear as close to Stuart as possible in order to decipher the words of his whisper. As I leaned over I caught a glimpse of his bright blue eyes rolling up and over to see who was bending near his wheelchair. His head permanently bent and turned slightly to his left, Stuart depends solely upon the movement of his eyes to change his line of vision. Those radiant, humble…and slightly mischievous eyes roll up to catch mine. “How are you,” I asked. “Good. How are you?” He replied in the loudest tone his voice can make—a whisper. Easing my ear next to his face, I saw hands once strong and able now pulled up in a palsy position, fingers tight and curled. I saw a back that bends inward above his waist causing him to gradually slide out of the seat of his wheelchair. I saw his right foot strapped tightly to its rest, keeping it in position no matter how far ahead of it his knee would slide as his body inched out of the seat. I saw Stuart’s left leg extended straight, unable to bend at the knee and bring his foot to the rest. Instead, his ankle met the footrest and a twisted left foot hung off the edge of the footrest. Those attending him must frequently nudge his body back in the seat of the chair and bend his left leg enough to temporarily get his foot back upon the footrest. I saw a miracle! An absolute miracle of God! How could that be? 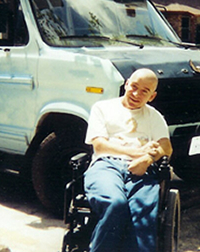 How could it be a miracle—Stuart remaining in his wheelchair, his body in such a twisted state and his voice barely audible? Read his story and see if by the end you do not agree. As a teenager, Stuart perceived his life in a way teens frequently do, feeling invincible and immortal, almost daring life to prove him wrong. In his hometown of Tomball, Texas, a suburb in a rural setting North of Houston, opportunities to accept the challenge of the dare abounded, fueled in part by Stuart’s passion for cars and trucks and the mechanics involved in customizing them not only to look exceptional but to perform exceptionally as well. Stuart’s humble nature prevents him from describing the many ways in which God has gifted him. His two college degrees include a degree in Horticulture, with a double major in Horticulture and Botany, and a degree in Secondary Education with a minor in Physics. His intellect, skill, candor and constant humor make him an excellent and well-loved teacher with both classroom and home-school students. 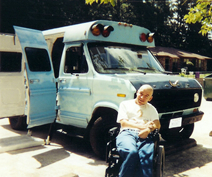 In fact, his ‘van’ was donated by a private high-school and its affiliated church. The students enjoyed Stuart’s ‘improvements’. Stuart loves to share the encouragement found in Jesus Christ to the people of Mexico. 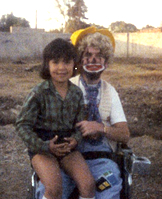 “I’ve been involved in Mexico mission work since 1987 and will be until I die, by going, supporting, or praying. Christians are not asked to share the love of Jesus in one way or another, but we are commanded to do so. Jesus’ last words before He went to heaven included a directive to spread the gospel to the ends of the earth. I have a love for the Mexican people and want to see them and others come to know Christ, joining me one day in heaven before His throne.